Revokes the last action performed by the editor. Restores the last revoked action. Cuts the currently selected objects from the map and stores a copy of the selection in the clipboard (requires The Selection Tool). Stores a copy of the currently selected objects in the clipboard (requires The Selection Tool). Pastes the content from the clipboard into the map. 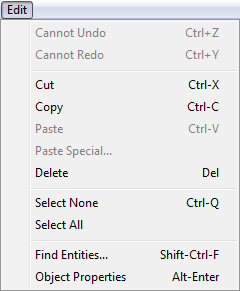 Opens the Paste Special dialog. Deletes the currently selected objects from the map (requires The Selection Tool). Selects all objects on the map. Opens the Find Entities dialog. Opens the Object Properties dialog for the selected object (requires The Selection Tool).